As Managing Director of the World Bank, from 2006 to 2010, Dr. Daboub oversaw operations in 110 countries in Africa, the Middle East, East Asia and Latin America. During those 4 years the World Bank Group tripled the size of its investment program to over $100 billion annually, and successfully brought the WBG’s investment, grant and advisory services to dozens of new partner countries and clients both public and private, including some of the poorest and most fragile states in the world. The World Bank is a vital source of technical and financial assistance to developing countries worldwide. Read more articles about Dr. Daboub's contribution HERE. The Forum is an independent international organization committed to improving the state of the world by engaging business, political, academic and other leaders of society to shape global, regional and industry agendas. Its Global Agenda Council on Climate Change, which Dr. Daboub serves as Global Chair, is committed in 2012-14 to developing recommendations for effective climate adaptation, including sources of funding, and a better understanding of resource and supply chain risk and opportunities. In addition, it will advance new models for effective climate governance to achieve the goals of the Durban Platform in 2015. The UNFCCC created the Momentum for Change initiative as a way of demonstrating the multiple benefits of addressing climate change and to transform misperceptions surrounding taking action on climate change. The secretariat believes that highlighting and enhancing the positive developments in the field of climate change mitigation and adaptation, will increase innovation, motivation, hope, passion and capacity for further change. When one speaks of 'transatlantic relations,' many have become accustomed to limiting their purview to the North Atlantic. In recent years, however, the peoples of the full Atlantic space -- North and South Atlantic together -- have been engaging and interacting in a whole host of ways that present both opportunities and challenges. CTR is working with an Eminent Persons Group drawn from the four continents of the Atlantic, as well as a new network of partner institutions across the full Atlantic space, to consider ways to work more effectively together with other Atlantic nations in an initiative for the Atlantic Basin. Click the image to view Dr. Daboub's talk at the International Forum on the Atlantic Area via the Haut-Commissariat Au Plan's website. America Libre is a think tank and center for the creation of new ideas and the implementation of public policy strategies to assist democratic countries and institutions in promoting freedom and prosperity for their citizens. Fusades is a nonprofit organization dedicated to private sector development and socioeconomic priorities. The organization works to promote work policy proposals in the economic, social, legal and institutional sectors in El Salvador. The Antigua Forum is an exclusive, annual gathering of market-liberal reformers from around the world. It brings together current and experienced reformers, political strategists, Nobel laureates, entrepreneurs and others who are dedicated to reform for an intense weekend of collaboration. The Antigua Forum is practical—participants work together to find solutions to real reform challenges. By the end of the event, participants walk away with concrete action plans as well as an understanding of why some reforms work and others fail, what conditions create opportunities, and how to overcome a reformer’s toughest obstacles. 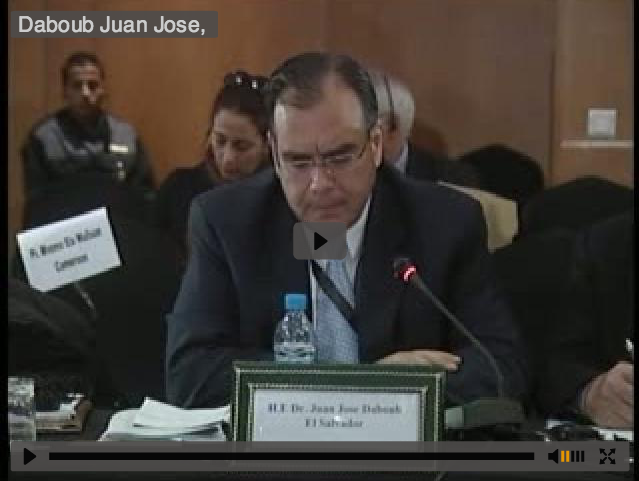 Dr. Juan José Daboub has worked or overseen work with governments and industries, as well as NGOs, including in China, Laos, Vietnam, Kenya, Senegal, Uganda, Panama, Honduras, Haiti, Brazil, Mexico, El Salvador, Morocco, Palestine, Colombia, United States, the European Union, Australia and the Pacific Islands in sectors such as economic reform, infrastructure, climate change, security, water, health and education. Salzburg Global Seminar: Juan José Daboub: "Politicians Are Always Thinking About the Next Election"
Scientific American: How Do We Solve Energy Poverty?